The medical community has long recognized the link between emotional and biological functions. Time and again, we see that the body’s physical response to treatment is dependent on emotional and spiritual healing. When negative emotions are overbearing, the immune system is negatively affected. Conversely, patients who release suppressed emotions increase positivity and can effectively heal cancer. The many studies recorded by researchers like Dr. Kelly Turner, author of Radical Remissions, detail this phenomenon. At Hope4Cancer, we strive to promote emotional and spiritual healing on a daily basis. Every treatment program includes individualized therapy sessions with our recall healing specialist. Meanwhile, our energizing social environment encourages powerful patient interaction. Exercise can help speed recovery, reduce side effects, improve prognosis, and reduce the chances of cancer recurrence. We help our patients develop a personalized plan of exercise consistent with their ability to handle physical stress focusing on low-impact, high-return options. The connection between emotional and spiritual states and the body’s biology is well established. Using individualized therapies, group sessions, and social bonding experiences, we help you learn the process of restoring your emotional and spiritual state to a health-restoring one. 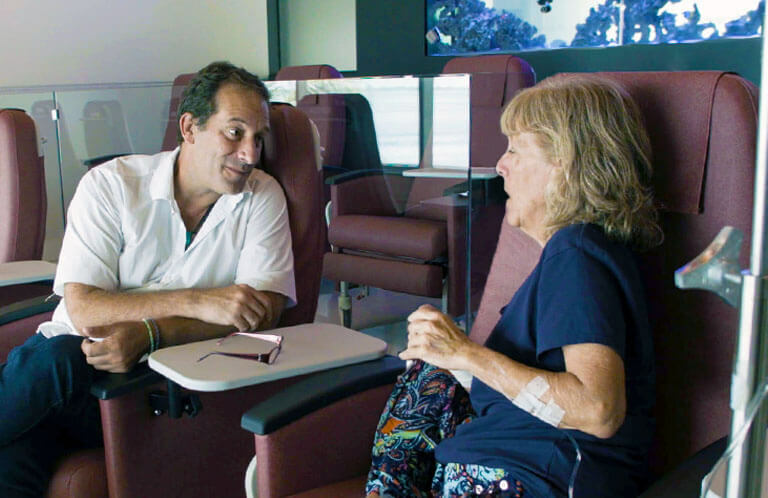 Our Hope4Cancer centers are more than just treatment facilities. Offering a unique experience, they’re a comfortable home away from home on your journey to healing. International locations allow us to employ alternative treatment methods not yet available in the U.S.A. or Canada while giving patients the opportunity to experience tranquil world destinations. Everyone’s heard the old adage: “when life gives you lemons, make lemonade.” It’s a proverbial phrase used to encourage optimism and a positive, take-action attitude when faced with adversity. But when you receive a cancer diagnosis, it can feel like fate has given you a bushel of sour lemons. We know from experience that what you do with those lemons often determines how you heal. If you’re concerned about traveling to Mexico, there’s no need to worry – traveling across the border is easier than you may think. Like any other country, Mexico has its rough neighborhoods and issues. However, our centers are located in safe areas on either coast where you will be able to rest easy in body and mind. Cancer is a little bit like a runaway train — the train must stop for the cargo to get out. Similarly, the first and most difficult step in treating cancer is to stop it from spreading. Sono-Photo Dynamic Therapy is one of the signature therapies we offer at Hope4Cancer, designed to halt and reverse the growth of cancer.